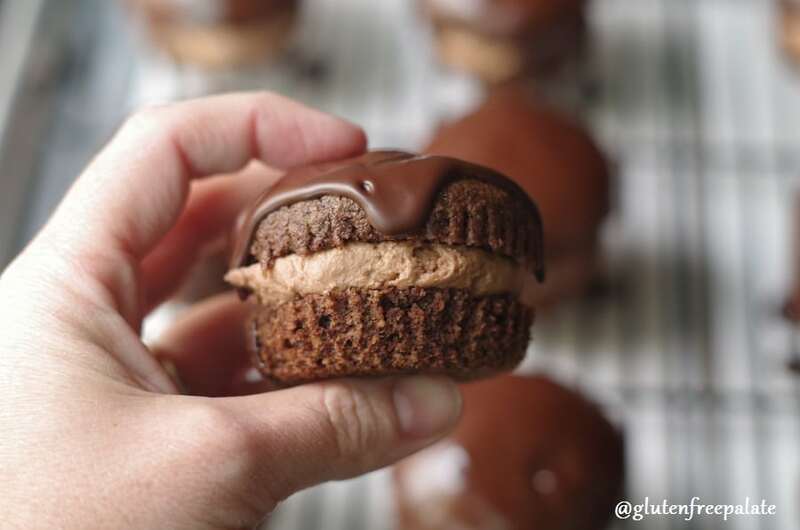 Gluten-Free, Grain-Free, Dairy-Free Triple Chocolate Ding Dong anyone? Your chocolate loving taste buds are going to do cartwheels in your mouth when you bite into this tender, rich, chocolaty treat. Are you as excited as I am? Say it with me, “Grain-Free Ding Dongs!” Yes! I love ding dongs and I haven’t had one since I was in Austin Texas last summer for the Gluten-Free Food Allergy Fest put on by Gluten-Free & More Magazine. When I was in Austin, two of my gluten-free blogger friends, Cindy from Vegetarian Mamma, and Pam from I am Celiac asked me to go on an adventure with them. They had heard a rumor that a local cafe (Wildwood Bakehouse) made gluten-free vegan ding dongs. I hadn’t had a ding dong since my early childhood and had to experience it for myself. Who would pass up a gluten-free ding dong? We got our ding dongs to go and headed back to our hotel. The moment I entered my room I popped the container open. It smelled divine! I ate it in under two minutes flat. Not even joking. And since then, I’ve been dreaming of enjoying another one. Last week was the Austin GFFAFest and I was sad that I couldn’t make it down this year. A couple of the bloggers stopped by Wildwood and posted photos of the ding dongs (and other yummy treats). I couldn’t resist the temptation to make them, so I ran to the kitchen (no seriously, I RAN) and looked through my cupboard to see if I had all the ingredients. Luckily I had everything to start testing my idea for the recipe. My husband and I are trying to eat less grains, so I opted to modify my grain-free Double Chocolate Muffin recipe in order to use it for the ding dong cake. I wanted it to be even fluffier than my fluffy muffins, so I omitted 1/4 cup of almond flour and they turned out PERFECT. 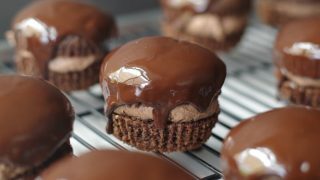 The rest was simple: make a fluffy, creamy chocolaty filling and drench it in my favorite chocolate coating. You can substitute maple syrup in this recipe for honey. The honey will change the flavor slightly, but the cocoa will keep the flavors balanced for the most part. Doesn’t powdered sugar have cornstarch in it? Traditionally, yes it does but there are several brands that don’t use cornstarch. Google powdered sugar without cornstarch and you will see a variety of current brands that offer that products. I’d list them for you here but they are always adding new ones and I don’t want you to miss out on anything. How do I make these grain-free ding dongs nut-free? 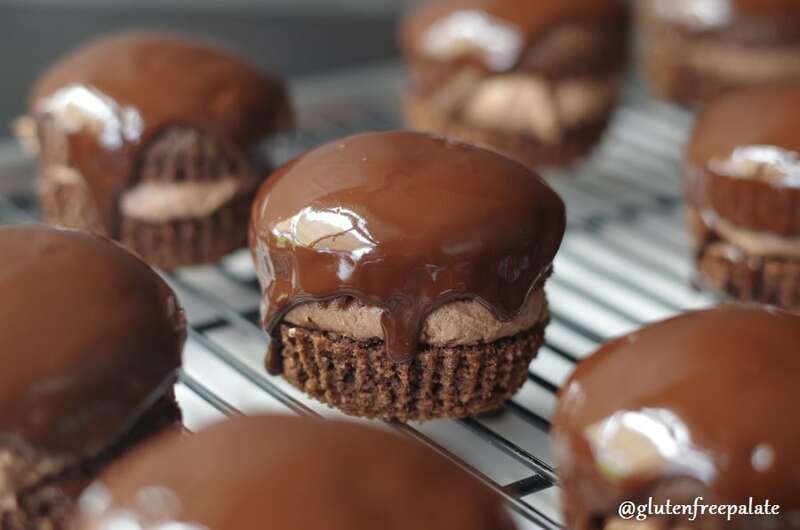 You could use your favorite grain-free chocolate cupcake or muffin recipe or if you don’t need grain free you might like my gluten-free vegan chocolate cupcakes. The ding dong cake is just a dense muffin/cupcake cut in half. Do you love grain-free recipes? You might like my Paleo Chocolate Chip Muffins or my Grain-Free Banana Everything Bars. Both are grain-free and use minimal ingredients. 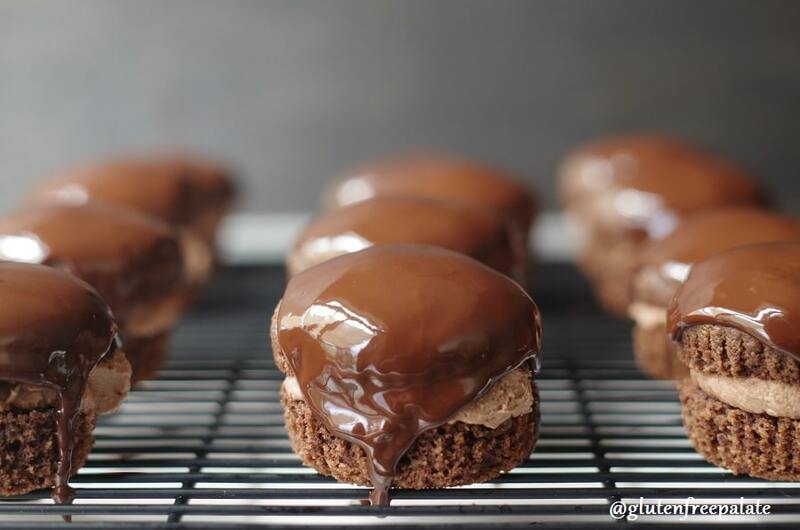 If you make these grain-free triple chocolate ding dongs please stop back by and let me know what you think. If you have a question please leave me a comment and I will get back to you. For the ding dong cake: Preheat oven to 350°F (180°C). Line a cupcake pan with 12 paper liners; set aside. Remove from the oven and let cool before cutting in half. For the filling: Cream dairy-free butter and shortening together until combined. Add in cocoa and 1 cup of powdered sugar. Beat until smooth. For the topping: Melt chocolate chips and palm shortening in a small mixing bowl in the microwave for 1 minute. Remove from the microwave and let sit for 2-3 minutes to the let the heat transfer to the chocolate chips. Stir until smooth and all lumps are gone. Assembly: Cut each ding dong cake in half. Spoon one tablespoon full of filling into the center of the bottom half of the cake. Place the top half on top of the filling and lightly press down until the filling reaches the edge of the cake. Spoon one tablespoon of melted chocolate topping on the center of the cake and let it drip down the sides. If needed, use the back of your spoon to help move the chocolate to the edges. Store ding dongs in an airtight container at room temperature. Those do look amazing for sure, Chrystal! Most powdered sugar does contain cornstarch so they would not be considered grain free, but it’s pretty easy to make your own that is grain free. Sharing! Thank you for the reminder Shirley. I updated the recipe. Any suggestions for making this without almond meal? My daughter loves chocolate, but has an allergy to nuts as well. Not severe like anaphylaxis, but they make her stomach hurt very badly. You had me at triple chocolate! Helllooo chocolate deliciousness! These look incredible! Well these just win! How beautiful, decadent, and delish!! Love it! Oh wow, this was dangerous to see before I’ve had anything to eat this morning. These look AMAZING!!! These look so amazing! Totally drooling over here!! This look AH-mazing, Chrystal! 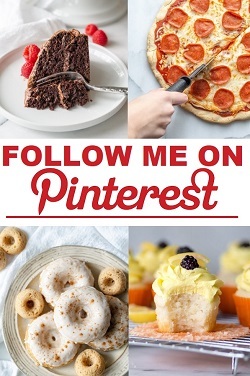 I can’t wait to try your recipe – Yummers! Yum, yum, and oh my, I want these now!!! They look amazing! Oooh I love this! And grain free too – can’t wait to try it! My girls don’t usually like almond flour treats, but they love this. I’m glad they have something grain-free that they love. These are drool worthy! 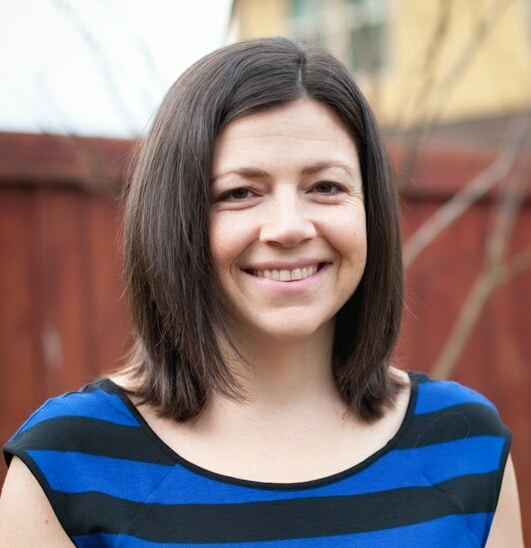 Thanks so much for sharing them at Savoring Saturdays linky party! I’ll be featuring them later today. Have a great weekend! Thank you for featuring them Emily! 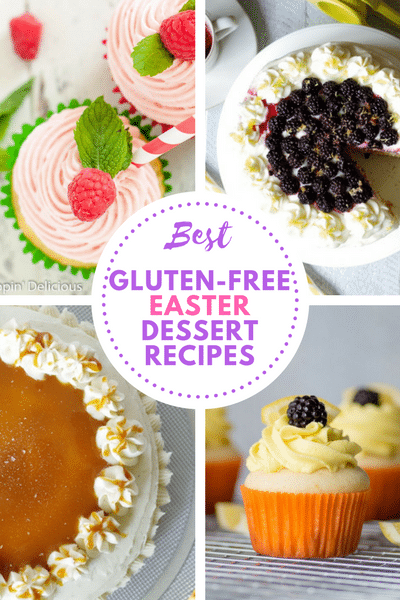 Triple chocolate and gluten free? I am definitely not dreaming! My goodness, they look delicious! Fantastic recipe!